Today Prisoners in Texas Went on Strike Against Slavery Conditions. In early March we received word that prisoners in Texas were planning a work stoppage to occur April 4th. You can read this announcement and their demands here. Here is a flyer put out by Texas prisoners and circulating through multiple facilities. Here is the announcement and demands laid out in easy to print and mail formats. 1 sheet 2 sides. 5 pages. Call TDCJ in Mon April 4th and Ongoing call in campaign to show your support and show the prisons that IWOC members got a posse! Reportback on your calls, and invite others to participate through facebook. 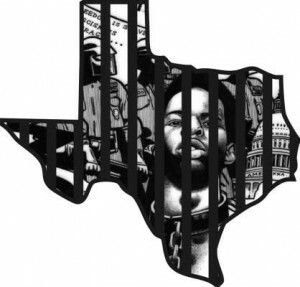 Solidarity Actions and Education Saturday, April 9th, please arrange a demonstration or educational event to awareness and understanding of the rolling strikes in Texas prisons starting April 4th. Please send pictures here and engage with media as much as possible. More information, suggestions and documents will be provided to help you with this effort. The prisoners themselves must remain anonymous to protect against reprisals and targeting by the authorities, but they have worked with outside supporters to craft the announcement of their demands and a press release. Use #EyesOnTexas on your social medias. This entry was posted in General and tagged action, incarcerated workers organizing committee, IWOC, Southwest, strike, support, texas, workstoppage on April 2, 2016 by Prisoner Support.